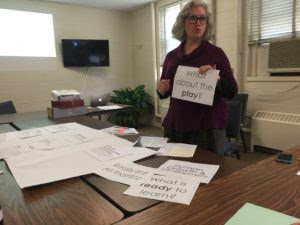 The Early Childhood Committee of NoVA Outside organized the “Getting Kids Outdoors in Nature” conference on March 25 at the Fairlington United Methodist Church. The conference brought together educators in varied roles from the usual mix of early childhood programs, all interested in learning more about nature education. In every session, participants shared their successes in teaching children in outdoor settings and problem-solved how to work through the hurdles that keep us from teaching outdoors. After the sessions we gathered for lunch and casual discussions. Lunch and networking, two very important experiences for earlychildhood educators that we often don’t get time for!